Does This Six-Pack Pregnancy Take It Too Far? 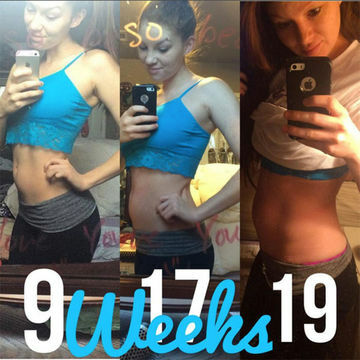 Yet another woman is showing off her sculpted pregnancy abs at 22 weeks pregnant. But is this trend safe? A medical expert weights in—no pun intended. Yet another woman has a full-on six pack visible on top of her baby bump. A fitness enthusiast who goes by the name @hannahbfitness on Instagram uses the social media platform to post photos of her growing baby bump. The fact that, even at 22 weeks pregnant, Hannah still boasts a solid six-pack is crazy impressive. One look at the lady's Insta page is proof that she's totally commited to fitness and living a healthy lifestyle—but it begs the question: Can you take fitness in pregnancy too far? A week ago, the Texas-based mom-to-be posted a photo containing a message from her doctor. "Doc says no more lifting," the image reads, complete with sad face emojis. "So recently, I have been getting what I assumed was Braxton Hicks. I called my doctor today about it because I had it three times this morning within about three hours, and he told me no more lifting and to limit my exercise. This baby is already trying to make his debut," she wrote in the caption field of the photo. Raul Artal, M.D., commented on the safety of Hannah's workout regimen to the Daily Mail. "All women in pregnancy can benefit from exercise with very few exceptions," he said. With that being said, Dr. Artal also added that women should be careful when lifting weights and should avoid lifting anything heavier than 88 pounds, as it may increase your risk of preterm labor. So there you have it. Hannah's six-pack may not have been easily won, but as long as she's listening to her doctor and her body, she's probably leading a very healthy pregnancy lifestyle.